For scrapbook Thursday I actually finished a layout this week. I have a pile of half finished scrapbook pages that I've been trying to plow through. Usually they're missing titles or journaling or that little something. This page was missing a title and a little something. 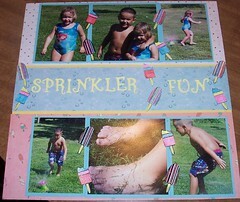 These sprinkler pictures are from this summer (yeah! Usually I'm a year or two behind) at my parent's house. I used the Imaginese papers and popsicle stamps. The title is made with one of my favorite fonts--fairy tale. It is a cuttlekids font and was very inexpensive. $17.99 regular retail, but I picked mine up when Michael's clearenced them out this winter.